Hello! I'm back over at One Stamp At a Time's fabulous blog hop! Our January 2016 theme is No Rules. 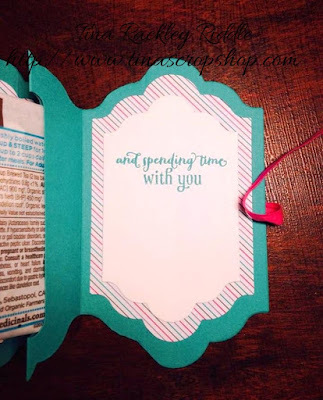 I LOVE the opportunity to create a card and project with no rules.. don't you?? If you have already been hopping, you should have landed here from Elizabeth Jeanne's awesome blog! She is so talented and always has amazing cards and projects! If you started with me, please make sure you hop all the way through. You won't want to miss a thing on this hop! Here is my card and project that were all about one of my faves.. TEA!! I love this new "A Nice Cuppa" Stamp Set with coordinating Cups & Kettle Framelits Dies and of course I LOVE that it comes in a bundle because as you know you save 15% right off the bat! Boom! I love to save money, don't you?? I also love this new Have A Cuppa DSP Stack. I used papers from this on both my card and project. 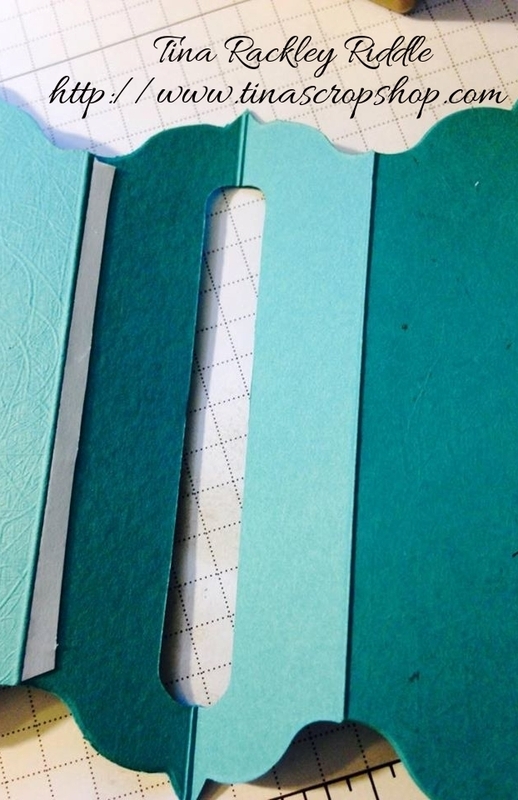 The Cardstock colors are Bermuda Bay, Melon Mambo, and Whisper White. My card started off with a A2 cardbase of Bermuda Bay. I added a 5 3/8" x 4 1/8" skinny layer of Melon Mambo and then a layer of 5 1/4" x 4" of Have a Cuppa DSP. The Melon Mambo Stitched Satin Ribbon was added to the DSP/Melon Mambo layers before attaching to the card base. 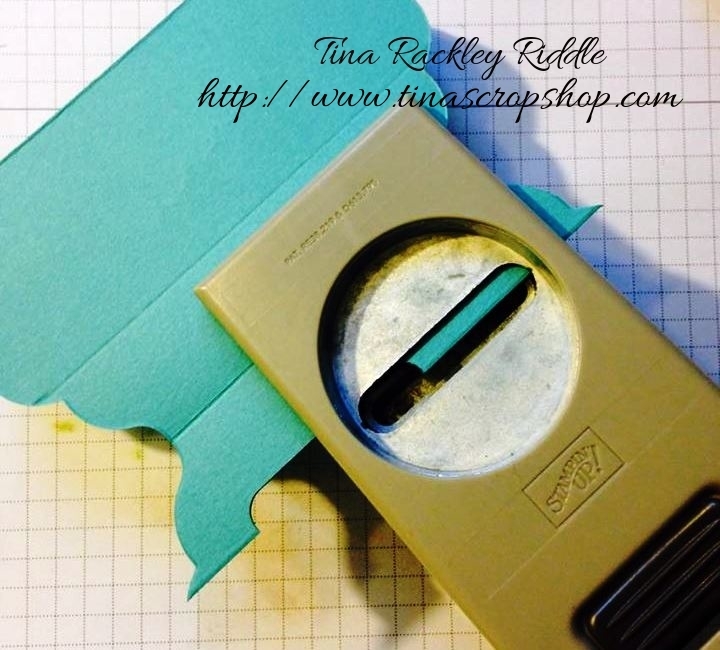 I cut a 2", 1 1/2" and 1" strips of more of that Have a Cuppa DSP and used my Triple Banner Punch to Punch out my ends. 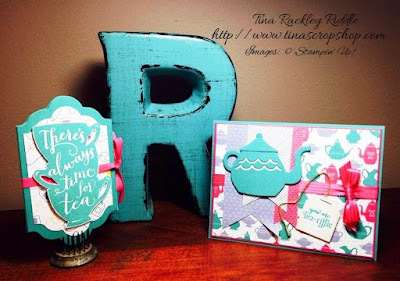 Using the coordinating dies I cut out the Tea Kettle with Bermuda Bay and popped it up with Stampin' Dimensionals over the banners. 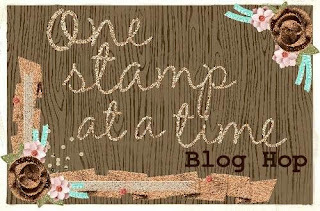 My sentiment was stamped with Bermuda Bay onto Whisper White and cut into a little rectangle with my stampin' trimmer I then made diagonal cuts on the upper sides of the rectangle to resemble a tea bag. I used some Sahara Sand Ink to distress the edges of my tea bag. Linen thread to attached with my stapler and then secured with a stampin' dimensional. I used Aileen's Fast Grab Tacky Glue to attach the linen thread to my card. It holds really well and works quickly! Here is the inside of my Tea Bag Holder..
For my Tea Bag Holder. I started out with a 8 1/2" x 5 1/2" piece of Bermuda Bay Cardstock. I scored the 8 1/2" side at 3 1/4", 4 1/4" and 5 1/4". I used my bone folder to smooth down the little accordion score lines. I cut the shape of my tea bag holder using the largest of the Lots of Labels Framelits Dies making sure to not cut through the folded side of the cardstock. After cutting out the shape of my tea bag holder, I used my Word Window punch to cut out a section of the center for the tea bag to be inserted. After cutting out the section for the tea bag to be inserted, Tear Tape was used to adhere the pleat. I cut my tear tape in half horizontally to make it thinner since I didn't want my tea bag to poke out of the side of my holder. After making my tea bag holder our of cardstock, I cut more of the Have a Cuppa DSP stack into a size smaller of the Lots of Labels Framelits Dies, one for the front and coordinating for both inside flaps. I used more tear tape to adhere the 1/4" cotton ribbon in Melon Mambo across the front and back of the holder. 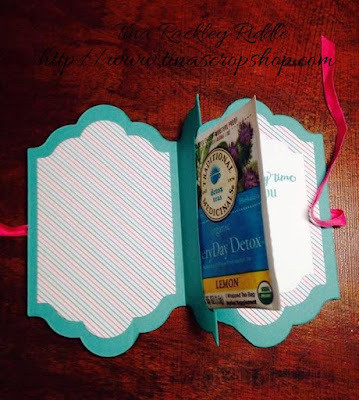 My tea cup stack and sentiment was stamped in Bermuda Bay onto Whisper White Cardstock and was fussy cut and adhered to the front with stampin' dimensionals. I thought it was the perfect size for this cute little tea bag holder. I also added a small piece of Whisper White Lots of Labels Die cut under the DSP layer on the inside for the inside sentiment. I think this little tea bag holder is so super cute and makes such a cute little set with the card. I hope you loved it too! To continue hopping just click the Next button at you'll be at Renee Ondraika's Blog! Renee is so creative.. you won't want to miss it! Here are all of our Fabulous Bloggers in case you lose your way! Tina Riddle - That's Me! What great projects Tina! Love the teabag holder - very clever. Love the card with the coordinating project. I will definitely need to try the holder out. Very cute gift idea. I love your shaped tea bag holder! Such a fun idea! WOW Tina...you do such clever projects! These are really bright and cheery too! Great project Tina! Love the ingenious use of word window - very effective. Adorable projects! Your tea bag holder is very creative! I love your sweet little tea holder. Simple to make, and delightful to give. What a great idea for the tea holder--so cute!! TFS, Tina! You always have fantastic projects! Such cute projects you have made with this set. Makes me wish I would have purchased it. I know there's still lots of time. ;) Thanks for sharing! Darling projects! Would make a great invite for a tea party with friends! Beautiful projects Tina! They are tea-rrific. Great Card and Projects! I love that you showed how to make the tea bag holder... You are the best Stampin' Mom a girl could have! Hey friend! As always your card & project are great! I've gotta try that tea holder! I really love this project! I had planned on making a tea bag holder in addition to my hot chocolate holder but hadn't dreamed of such a sleek design as yours! Thanks for sharing how to do it because I certainly plan to case your design!